Life Terpene process can be subdivided in four sections strictly connected. This process allow a complete recovery and valorization of all the components existing in the citrus fruit pulp deriving from the citrus fruit juice. The finished products present a complete environmental compatibility and can reduce evidently the environmental impact in many application related to the organic solvent use. The PIDIC process ("Peels Improvement by means of Instant Controlled Depression") has been recently developed and patented by Contento Trade. Thanks to this new process it's possible to extract the essential oils contained in the citrus fruit pulp without altering theirs physical-chemical and organoleptic characteristics and, in the meanwhile, to modify the structure of the vegetal residue to facilitate its successive desiccation or chemical treatment. It's a thermal mechanical innovative treatment; it can be applied both to lots of material in a suitable treatment chamber (static PIDIC) or to a homogenous flow of material, thanks to an apposite treatment duct (dynamic PIDIC). The first process is very useful for the preliminary lab study and for the treatment of very delicate materials, thermal sensitive or with high added value; the second process results particularly economic and efficacious for the treatment of big quantities of materials, as the citrus fruit pulps. 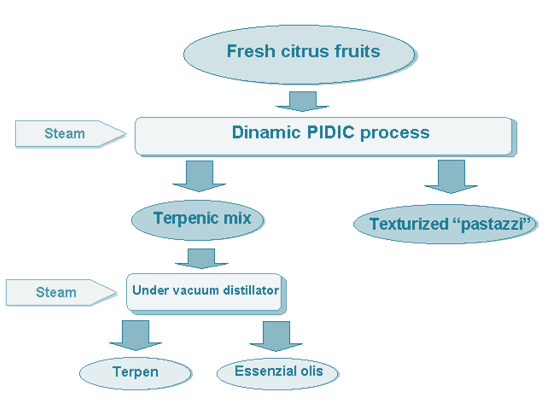 The plant structure for the application of dynamic "PIDIC" to citrus fruit pulp is here after described and illustrated. The raw material (citrus fruit pulp) is put in the chamber 2A and a certain quantity slides in the chamber 2B, ready to be treated. In the chamber 2B is placed, thanks to the boiler 1, some steam at high pressure that warms the material till softening at the right point. The valve 3, that is opened after some seconds, connects instantaneously the treatment chamber 2B with the vacuum chamber 4 (that is maintained at a high depression level thanks to the pump 5). This sudden shift of pressure causes a controlled expansion of the treated vegetal structure and the explosion of the utricles containing the essential oils with immediate evaporation of the volatile compounds (essential oils). The pressure shift causes a quick temperature decrease both in the chamber and in the vegetal structure, that becomes "texturized". The texturization consists in the creation of a series of utricles of regular volumes in the vegetal structure that increases its specific surface. The vaporized compounds are instantaneously aspirated in the treatment chamber 2B, through valve 3, in the vacuum reserve and then are condensed in the cooling chiller 6. Periodically the condensed liquid is transferred in the collection chamber 7, This liquid contains normally water, terpen and essential oils that can be easily separated with vacuum distillation. The plant can both be used for the citrus fruit peels, flowers, entire citrus fruits. The second process section is based on the turbo drying process and allows to desiccate extremely well the citrus fruit pulp to make them useful for other applications. As alternative to the desiccation process it's possible to use the citrus fruit pulp deriving from the Section 1 for the pectin production with the method described in Section 4. Each turbo dryer is planned and realized applying an original technology patented by VOMM. The principle is based on the creation and advancing of a thin material stratum, in strong turbulence within the stratum, adherent to the internal walls of a cylindrical surface, though this thin stratum it's possible to exchange heat with high exchange coefficient and high thermal efficiency. The product to be desiccated is alimented by a cylindrical horizontal element in which a turbo agitator centrifuges the material on the internal wall. The heating is realized mainly indirectly by diathermic oil conduction in the coaxial part with the cylindrical element and starts directly by convection with preheated air. This mechanism allows to use limited quantity of air, without direct flames, and is consequently suitable in the material recovery plants (it avoids alteration of the products with creation of degraded substances difficult to be eliminated). As the treatment occurs in hot air current there is the phenomenon of the "humid bulb" that maintains the material at temperatures around the 80° C.
The VOMM turbo desiccators are extremely reliable, constant and need a very reduced maintenance. Another positive characteristic that they present is the possibility to treat materials of different texture (liquids, semi liquids, slime, pastes and mixtures of heterogeneous products) very easily. The efficacy of the thermal treatment at high temperature doesn't imply on the other hand an uncontrolled temperature increasing of all the mass, and excludes the dangerous risks of overheating that can originate combustion or self combustion phenomena. The ratio surface/mass is noticeably valorized with this procedure, so the thermal exchange on each particle on the hot wall results the sum of a great series of contacts each of one for very rapid periods. Consequently the desiccation process doesn't require neither long treatment periods nor prolonged exposition of the material surface to the heating source. The product in this way doesn't reach temperatures superior to the pre fixed security values, both for the thermal exchange technique adopted and for the insertion of control instruments that allow to verify continuously the operative conditions of the plant and so to modify, with simple operations, the parameters in short times. For the citrus fruit pulp a desiccation process realized at open cycle is more suitable. the product, opportunely grinded with a specific Vomm mill, is alimented through a pump to a volumetric batcher, that has some sensors of "material presence" and that provides automatically to the supplying of new material to be treated; it feeds the product at controlled capacity and variable depending on the conditions inside the turbo desiccator. If the product lacks for a certain period, an acoustic alarm starts up and also the automatic stop of the plant can be planned. At the starting of the plant the engines are activated in logic sequence and with opportune agreement. Similarly the stop of the plant is automatic for any problem of the single engines. A continuous stirring system in the batcher guarantees a constant alimentation and prevents the formation of clots in the fresh material. Within the turbo desiccator the product is centrifuged by a rotor that turns at adequate speed to guarantee the formation, maintenance and advancing of the material stratum. The continuous stratum of material that covers the internal part of the turbo desiccator for a ten mm after some seconds is desiccated and stabilized and comes out from the plant. In equi-current to the material, a preheated air flux acts essentially as vector fluid to remove as quickly as possible the steam water that is continuously developed by a thermal exchange of the product with the hot walls of the turbo desiccator. A thermal jacket, run through by a diathermic oil, covers all the machine. The rotor has its support and rolling members on the external part of the evaporation chamber and, consequently, well protected by soiling risks. The cycle is in slightly vacuum so, till the product is desiccated and stabilized by a cyclone, any kind of dust coming out in the environment is prevented. The carrying hot air is obtained at controlled temperature by indirect thermal exchange between air and diathermic oil. The wet air and the desiccated product are separated in an adequate cyclone where the dry product is put by a bottom valve. A sensor signaling assures the control of the correct emptying of the cyclone. The air mixed to the steam is washed in a scrubber and then directly sent to atmosphere. The diathermic oil used un the desiccation plant is maintained at the right temperature by an autonomous high yield boiler for the heating of the diathermic oil. There in after is presented a process diagram that justify the turbo desiccator plant structure optimized for the treatment of the citrus fruit peels. Di seguito vengono evidenziati alcuni particolari aspetti tecnologici ed impiantistici che caratterizzano la tecnologia VOMM di essiccazione. he treatment process of citrus fruits pulp also called "pastazzi" is based on the use of a turbo- desiccator already widely tested on this kind of product . This treatment, to be valid, must be aimed at obtaining the maximum qualitative result with the minimum production cost. 1. Waste pretreatment: this process must be executed with a particular attention to the hygienic and environmental problematic. Te citrus fruit peels coming from the PIDIC process are practically pasteurized but during the transportation or stocking phase could have had a new bacterial attack. All the operation concerning the collection and transportation of the wastes must be very carefully executed to avoid any kin d of pollution focus (so the collection hopper of the by product must have the top and must be easily washable and treatable). 2. Grinding: in a VOMM mill specific for damp products, the wastes coming from the hopper are reduced in mush quickly. During this phase also the homogenization of the different parts happens. All the parts of the line in contact with the product are made by stainless steel AISI 304. The product, reduced to mash, is unloaded in a pump type MONO that doses the exact quantity of mash to the following desiccation phase. 3. Desiccation: the grinded product having initial humidity of about 80% in led to a final moisture tenor of 10-15% to allow the conservation of the product itself in the time. 4. Cooling: the dehydrated product is non stop cooled by mixing cold air in a pneumatic transport. An properly dimensioned cyclone will then divide the product from the cooling air. The cool product will be easily stocked and/or sacked, or sent to a pellet plant. The Section 3 of the process permit to transform the desiccated citrus fruit pulp ("pastazzi") in four high added value products: feedstuff for animals, paper, combustible material, thermal insulating grains. The production process of the thermal insulating micro grains has been tested also with a preliminary pilot production. The preliminary PIDIC treatment hasn't been used till now for the pilot tests, but the developed lab tests gave very encouraging results on its influence on the density of the obtained thermal insulating grains. The turbo granulation treatment can be performed by a turbo desiccator plant with a specific system and unite in one only plant the molding of the finished product and its desiccation with many advantaged from the energetic, environmental and economic point of view. 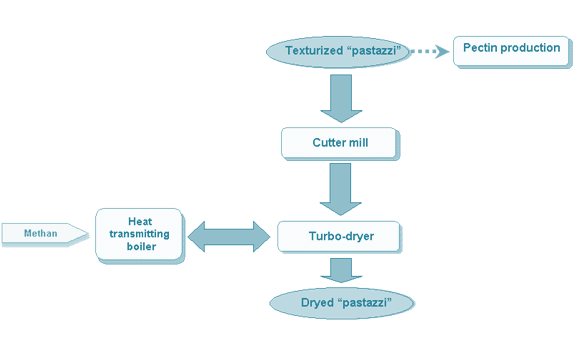 The final post treatment can be done both by simple systems of spraying in rotating cylinders, eventually heated, and in specific turbo-cooking plants if a high quality of finished products is required. The by products of these processes are limited to the fumes deriving from the combustion of the used materials to feed the burner and to the water steam. This section wasn't initially foreseen in the first working plan and is the result of the collaboration between Contento Trade srl and Master Green in researching new application at high added value for the citrus fruit pulp. The process has been recently patented ("Thermal insulating and deadening material" FI/012285/IN) but the tests have been performed mainly at lab level, except for a pilot production by Vomm. The thermal insulating material consists in cellulosic grains finely fissured hydrophobised, mould proof and bacteria proof thanks some boron salty solution. The tests performed showed that the Vomm turbo-technology is able to produce, with amazing easiness, these grains starting from a citrus fruit homogeneous mass, and at the same time to desiccate them. Vice versa, the PIDIC process seems to influence the physical and mechanical properties of the obtainable grains modifying the quantity and dimensions of the alveoli included in the cellulosic mass. The thermal insulating material obtainable has similar characteristics to the cork (good thermal and acoustic insulating properties, good transpiration properties, stability in wet environments, etc) and needs treatments with interesting and competitive costs, both with the cork ones and with the less "noble" materials as expanded polystyrene and mineral wools. The possibility to obtain these grains with size among 3 and 10 mm with a low specific weight (about 265 gr/1000 ml of occupied volume) is very interesting from the thermal insulation of interspaces and not pedestrian roads. Moreover a process for the grain agglomeration in panels able to substitute cork and polystyrene in nearly all their application is under study. Herein after some coefficient of thermal conductivity of different insulating materials, among which also desiccated citrus fruit pulp, to underline their properties. An use of the juice production wastes is the transformation of the citrus fruit pulp (that include peels, seeds and residues) in fillers for paper. On the basis of previous experiences of Geopolimeri company (see project Life n° 93/I/A124/I/2149 and Life n.95/IT/a13/IT/393/VEN) it was decided to opt for the complete reuse of the citrus fruit pulp, transforming it by micronization in unrefined flour. These residues to be reused in paper must be transformed in an unrefined flour, insoluble and homogeneous, with a particular grain size. This flour must be well preservable, well wettable and well linkable to the fibrous part of the paper panel. For this purpose the starting material must be desiccated, grinded and finally riddled. As concern the micronization of the desiccated product, all the used residues have been grinded in the micronization mill of Cartiera Favini. The flour has been introduced in the productive cycle, in substitution of the mineral fillers traditionally used by the paper industry. The introduction of this flour happens directly in the pulper of the continuous plant, together with other raw fibrous materials. 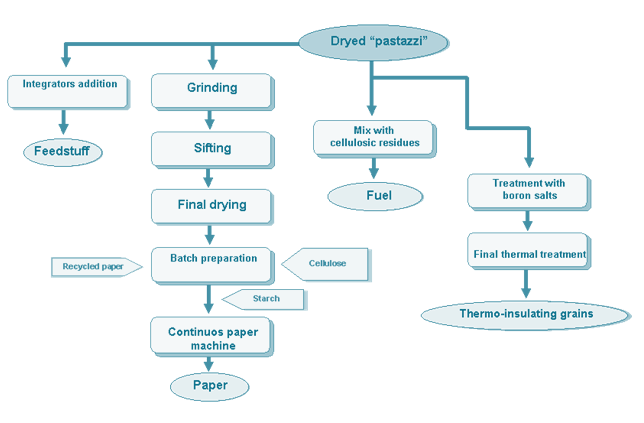 The complete flow chart for the production of Citrus Paper is here reported. 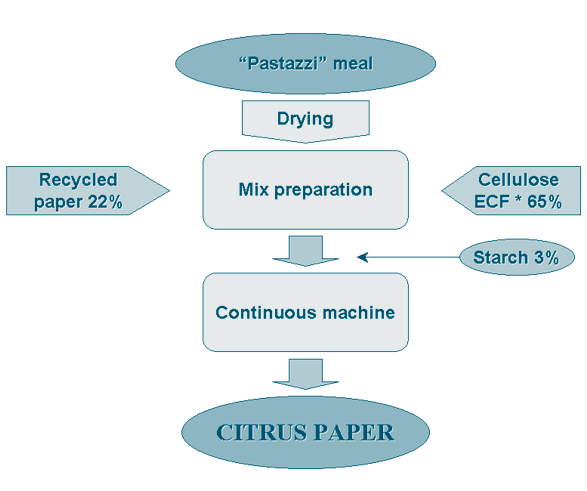 The paper obtained from citrus fruit pulp, as the Citrus Paper (produced by Favini licence), has a pleasant aspect and can be used for many applications (writing paper, printing paper, edition paper, packing paper). The cost analysis showed that the cost of this new paper becomes competitive when a certain quantity (corresponding to 5% of the annual productive capacity of the non-stop paper machine) of paper is produced. The deterpened residues are desiccated, micronized, riddled, sacked and used as "unrefined flour of deterpend citrus fruit pulp". The obtained flour is easily usable in the paper production as organic fillers for paper, substituting the mineral inorganic filler as kaolin, tals, calcium carbonate. This filler needs, to be produced, a smaller quantity of not renewable raw materials. Moreover it allows an energetic saving during the workings and has a higher calorific value (that is better of about 10% compared to the traditional similar paper). Citrus Paper is easily recyclabe and has an improved biodegradability. The supplier of deterpened citrus fruit pulp is Obipectina Italia Spa of Messina, in Sicily. The residues of the citrus fruits squeezing degrade very rapidly. For this reason we decided to operate with citrus fruit pulps desiccated by the producer of these residues. The squeezing citrus fruit residues have been declared reusable by Provincial Administration in Vicenza – Environmental Department – on the basis of the Italian Legislative Decree Ronchi, the 2nd April 1998 (Decree n° 272 – Prot. N° 18.185/ECO of 24.03.98). The quality of the obtainable paper is surely high and its aesthetic aspect very interesting. These are the physical-mechanical characteristics of the Citrus Paper. Some tests have been executed starting from the fresh citrus fruit pulp and desiccating them with the previously explained method, to test the quality of the material as feedstuff for animals. The tests gave positive results: the citrus fruit pulp homogeneously desiccated and micronized to obtain a dimension inferior to the traditional rotative oven one, give a raw material without burning and so of excellent quality very suitable for animal feedstuff. The product, moreover, results particularly complete from the nutritional point of view: as the citrus fruit pulp hasn't been burnt during the desiccation, the vitaminic content is higher and so the feedstuff is rich and energetic. As concerns the test executed by Vomm on the combustible material, the obtained results can be considered really satisfactory. the combustion of 222 kg of desiccated citrus fruit pulp, with caloric power of 3.400 kcal/kg produces 754.800 kcal. In this way the process has a positive energetic balance that will be possible to improve using texturized citrus fruit pulp by PIDIC process as raw material for the turbodesiccator; consequently it's assumable a reduction of 20 – 30% of the energetic consumption in the desiccation phase. The Section 4 of the process is dedicated to the pectin extraction from texturized citrus fruit pulp ("pastazzi") produced in Section 1. The environmental evaluation developed in this section are limited only to the production phases of the analyzed materials and are not extended to other parts of their life cycle. This exclusion is surely justifiable as regards the products deriving from vegetal materials, because of their complete biodegradability, while is an undeserved prize for synthesized materials as the chlorinates solvents used in the ecoprofiles comparing phase. Aim of this section is to show that, even in these penalizing conditions, the citrus fruit derivatives are preferable to the synthesis products. 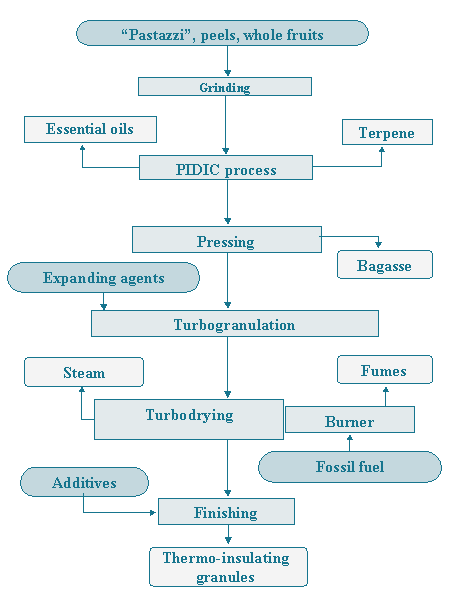 In this paragraph it's calculated the impact of the terpenic solvent production with the PIDIC process. The data are limited to the production of terpenic mix with the PIDIC process executed in a plant near the citrus fruit producer and are not considered the impacts deriving from the deterpenation process, to simplify the operation. This exclusion is justified because the deterpenation process is necessary to produce good quality essences and so it should be completely allocated to the product "Citrus fruit essence" instead of to the "Terpenic solvent". The impact is related to the production of terpenic mix and has been compared to the impact of two synthesized solvent with good properties similar to terpen: the trichloroethane and the tricloroethylene. All the environmental impacts related to the trichloroethane were found directly on environmental databases, while for the trichloroethylene and the terpenic mix the calculations were made on the basis of the input and output of the production processes used. in the study regarding the trichloroethylene the impacts deriving from different processes used to obtain one kg of final product, included extraction and raw material transport, have been considered (excluded the contribution of the distribution net of the electric power). The impacts deriving from other by products used in other processes have been excluded. Regarding the terpen, the transport impact of the raw materials (citrus fruit pulp), as above mentioned, are of no importance, while the production process of the citrus fruit pulp hasn't intentionally been considered because it's part of another production chain (the citrus fruit pulps are wastes of the agro food industry). Neither the process water, that can be re used in the process without being thrown away (and so owning to a category of reusable by products) has been considered as a production output. The ecoprofiles of the two chlorinated solvents (trichloroethane and trichloroethylene) with the above mentioned limitations, have been compared to the terpen ecoprofile. The results have been summarized in the following graphics that report in logarithmic scale the used resources (INPUT), the emissions (OUTPUT) in air and water and the solid emissions in the three cases. To simplify the exposition, the values have been expressed in kg of substance per kg of finished product and have been multiplied by a factor 1014; other measurement unities are reported in the graphic. From the graphic analysis it's possible to conclude that there is a lower impact of the terpen compared to the two industrial solvents, both in terms of quantity (lower concentration of emitted substance) and quality (number of polluting species released by the terpen production). It's evident that, even taking into consideration the only production phase, the terpenic mix ecoprofile is surely preferable to the other two.